Aurora Cacciapuoti, author/illustrator of Baking with Dad answers our questions! What inspired you to create Baking with Dad? I love to cook so I really wanted to draw a picture book that talked about food and having fun cooking and baking. Did you bake often when you were little? A lot, my favourite one was the Sachertorte. I used to bake in the afternoon and bring the cake to school for my classmates the day after. Everyone was really happy about it! What is your drawing process like? I doodle on my sketchbook a lot. When I've found an idea I like I draw with pencils, I use my lightbox to redraw the illustration with coloured pencil or ink and nib. Then I scan the image and I colour with my computer. Did you have a favourite place to work on the book? If I just want to doodle I prefer to go out in a cafè, otherwise I go to my studio. 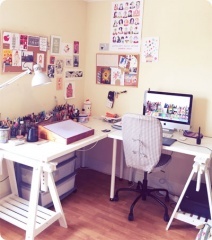 I have a shared studio with other illustrators, I love it, it is a really nice place to work and everyone is lovely. It is good to have lunch break together and be able to speak with someone when you need an advice or just to show new ideas. I love the classic "Ciambella" or yogurt cake. CLICK HERE TO FOLLOW AURORA ON TWITTER! Today we’re baking with Dad! We have everything we need, including the most important ingredient – Dad himself! But who are we baking for? And who’s going to do the clearing up?